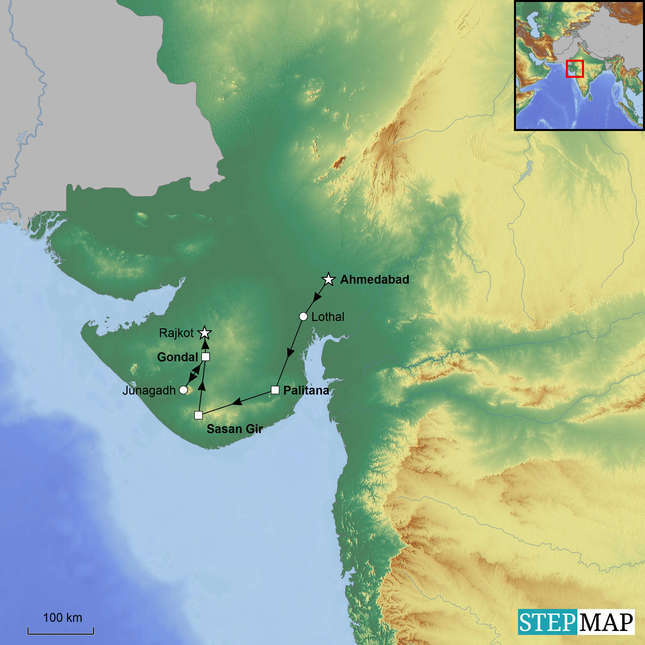 The Classic Gujarat tour offers a superb introduction to this culturally and architecturally distinct region of India, which was once an important trading hub and today offers an incredible range of experiences for intrepid travellers. Begin your private Gujarat tour in the walled city of Ahmedabad, a bustling metropolis that has preserved its rich multi-cultural heritage including 15th century Sultanate period monuments. Then, discover the largest man-made dock from the Harappan period at Lothal, before arriving at the small town of Palitana, which is an ideal base to climb up to the summit of the sacred Shatrunjaya Hill and visit the splendid Palitana Jain Temples dating back to the 11th century. Next, enjoy thrilling jeep safaris through the picturesque Sasan Gir National Park, where Asiatic Lion sightings are virtually guaranteed. Then, embark on a tonga-ride (horse-drawn carriage) through the old princely state of Junagadh and discover outstanding Indo-Islamic style monuments including the magnificent Mahabat Maqbara tomb and the impressive 15th century Jama Masjid that showcase the influence of the Mughals and the Gujarat Sultanate. Along the way, visit Gandhi’s Sabarmati Ashram that will reveal Gujarat’s role in shaping India’s modern history as well as the famed Calico museum, dedicated to showcase Gujarat’s outstanding traditional arts and crafts and treat yourself to delicious Gujarati street food. This Classic Gujarat tour will undoubtedly be rewarding to those who would like to explore an emerging destination that is rich in culture; offers diverse experiences and is regarded as India’s rising star. Day 5 Early morning and late afternoon private jeep safaris. Day 7 Spend the day exploring the former princely state of Junagadh. Day 8 Drive to Rajkot, where your tour concludes. Farewell to Gujarat. Morning visit to Gandhi's Sabarmati Ashram. Then, continue to Palitana. Drive to Rajkot, where your tour concludes. Farewell to Gujarat.